Price: 14.95 Euros available from specialist book and hobby shops, or direct online from AirDOC Publications. Advantages: Good coverage of Luftwaffe Starfighter JABO units. This new book on F-104G fighter-bombers is the first of new series from German publisher Air Documentaries (AirDOC). 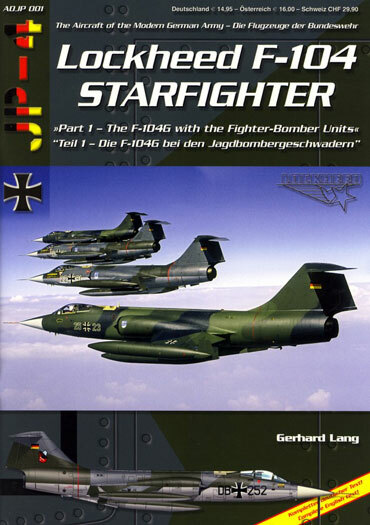 The Starfighter was probably one of the most important aircraft types to see Luftwaffe service, holding the line against the Soviet threat from 1961 to 1991. Whilst initially suffering from a poor reputation due to its high accident, eventually the Starfighter matured into a fighter, strike, reconnaissance and maritime strike aircraft for both the Bundes Luftwaffe and Marine. Part One of Lang’s history of Luftwaffe Starfighters is devoted to the Luftwaffe fighter-bomber units that were equipped with the type. Lang addresses his subject by providing a short history of the F-104 and the collaborative production arrangements which led to F-104s being built for a number of NATO countries including Holland, Belgian and Italy along with Germany. A chapter is then devoted sequentially to JaboGs 31, 32, 33, 34 and 36. 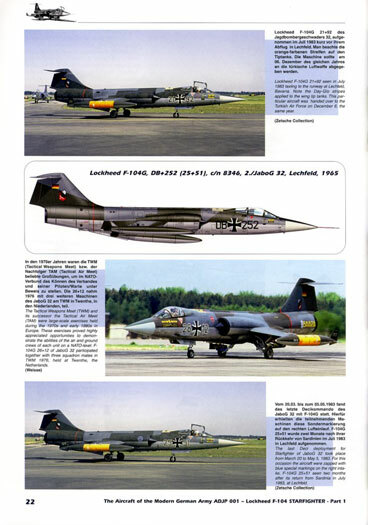 Each chapter contains numerous photos of those units F-104s, along with profiles and clear captions which give all the details a modeller could wish for. In summary, this is very nice package and I look forward to reading Part 2. Modellers and historians alike will find it an extremely useful addition to the library.